I have mentioned my love of OPI nail polishes many times here on Picturing Disney and our Facebook page but arguable the Oz line is my favorite yet. 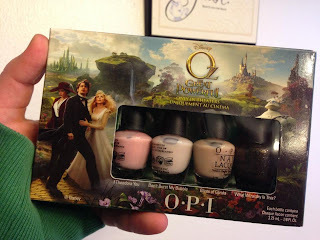 I have been looking for nice, sheer, neutral shades for months now and found them in a range of shades in this set of Oz inspired minis from OPI! The image below gives you a small swatch of the color on one of my nails with the name of each polish. Glints of Glinda is a true neutral (and my favorite which is featured on my nails in the photo above), while Don't Burst My Bubble has a whiteness to it and I Theodora You a pink hue. The fourth color, What Wizardry is This? is a glitter that seemed a little more of a Fall/Winter color because of the earthy brown sparkle. This is a great set, and while sometimes the minis don't showcase the best of the line I think this set does. I purchased my set of minis on Amazon and even though the price has gone up I think they are worth it. These colors are still new so keep your eye on local salons and other stores which may carry OPI (and for a possible price drop on Amazon) when they officially release the line in March!